Another week gone by and more fun stuff to share with you guys - having this blog + the past year in my business has been life-changing in so many ways. You may not guess it, but I'm actually a pretty big introvert...Big crowds, parties, new situations - totally freak me out. Truth be told, at the end of the day I'm happiest at home, snuggled up with the hub or my boys on the couch. One thing that really gets me stressed??? Travel - I worry the weather will be bad, that I will forget my necessary documents, that someone will get sick, the list of reasons why I shouldn't travel grows and grows anytime I anticipate a big trip. Its actually a huge reason we bought a lake house - instead of traveling on vacation each year, I can simply have a vacation that is home. But this time, I'm deciding to step outside my comfort zone and take a leap of faith! Still smiling after signing up for Punta Cana! One huge perk of my Beachbody business is an annual trip we can earn for free - well, last year I dragged my feet and missed out a cruise that I would have gone on 100% free. Aaargh - talk about needing to get out of your own way!!! So, I'm happy to report - I have officially signed up to go on this year's trip to Punta Cana -Eeeek! Bringing my men and actually pretty excited about it - guess its time to get a passport! I will probably be a bundle of nerves, but thinking of the memories we will make, gets me excited enough to overcome the crazy thoughts in my head. Hopefully you don't think I'm nuts - but maybe you feel the same way too? If so - no matter what your fears or anxieties are, step outside that comfort zone! Who knows what lies on the other side!!! Ok, enough about me - its time to talk about this weeks Fresh Mama Finds. First up: Foodstirs - Any Sarah Michelle Gellar fans out there??? Well, I follow her on Instagram and saw her posts about these fun baking kits for families. It includes the dry ingredients + recipe + a kitchen tool you can keep! My 10 year old niece loves to bake and I knew this would be right up her alley! We purchased the 3 month subscription and so far she is loving it. They look so good! Glad I wasn't there to be tempted or I totally would have inhaled one! Nice work - Katie!! Now this next Find is a "must-do" - especially if you are someone who loves self-improvement and wouldn't mind a little more happiness in your life! 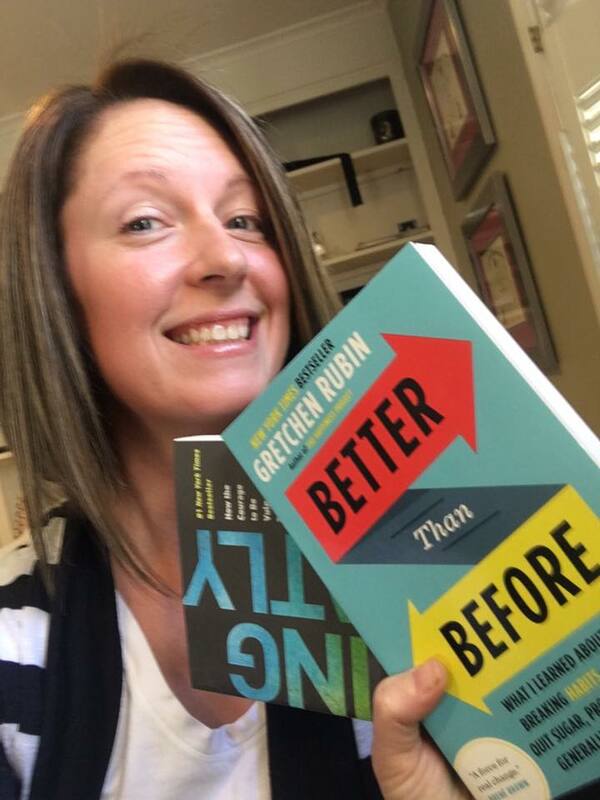 Better than Before by Gretchen Rubin is all about habits and how our daily habits can create or impeded our ultimate happiness. As of today, I'm about 3/4 the way through this book and wow - mind-blowing! She also has a podcast "Happier with Gretchen Rubin", so I definitely recommend that if you want to feel her out before getting the book. I'm gearing up for my February support group - a private group for women focusing on fitness, nutrition, and self-improvement. In addition to our fitness program and nutrition plan, we'll be reading + implementing specific personal changes based on the philosophy from this book. One very important thing I've learned through coaching 100's of women over the past year - is 80% of the hurdle is mental! The support of women in the group is truly the key to my client's success. Having that accountability and 24/7 support is invaluable! If you feel you're ready for a change and have big goals for 2016 - just reach out via this online form and we can get you started on YOUR journey!